Generations of customers have been using our range of on-axis paraboloids. Our heritage over 45 years goes back to the production of large astronomical telescope optics, in excess of 1 metre for the Royal Greenwich Observatory and other prestigious customers. The f-number that can be achieved is higher therefore more energy can be concentrated. For the same apparent f-number an on-axis paraboloids would be less expensive. Generally, alignment is less critical, thus easier. 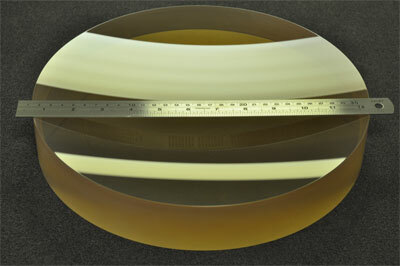 Optical Surfaces have supplied on-axis parabolic mirrors for the VLT telescope in Chile and for the KECK and SUBARU NAQJ telescope in Hawaii. The mirrors are at the heart of the laser guide star system used in these huge instruments. The light weighted mirrors have a diameter of 516mm and because they are retrofitted to an existing structure with limited space between the top of the dome and the top of the telescope, they had to have an f ratio of 1. 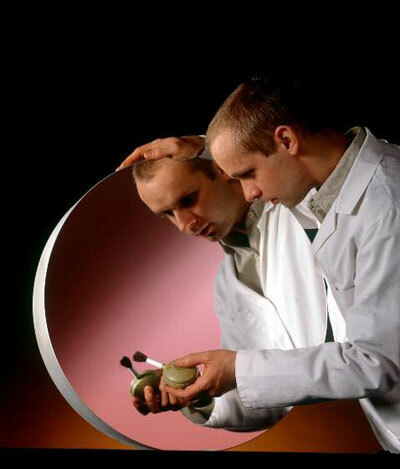 The mirrors also had to achieve a wavefront accuracy of 25 nm RMS. The laser guide stars are an essential part of the alignment of the 8.2 meter segmented primary mirrors. The high output laser fires a beam of light at a wavelength of 589nm into the sky where they strike the layer of sodium atoms .The atoms are excited and glow producing an artificial guide star, towards which the segmented mirrors are aligned in order to produce optimum system performance. This system allows measuring and correcting for the effects of turbulence in real-time using the piezoelectric driven adaptive optics. The telescopes viewing ability has been improved by a factor of ten, dramatically increasing the contrast and detail detection enabling astronomers to study objects that where previously unobservable. A spokesperson involved in these projects said that the performance, on the SUBARU was “superior” to the one achieved on the VLT and the customer felt the need to “congratulate Optical Surfaces on their contribution to the project”. The SUBARU telescope is an 8.2-meter optical infrared instrument on the summit of Mauna Kea, Hawaii, operated by Japans’ National Institute of Sciences.